Being guest crew on Pride of Baltimore II is a unique experience, but don’t expect a pleasure cruise with cocktails by a hot tub! 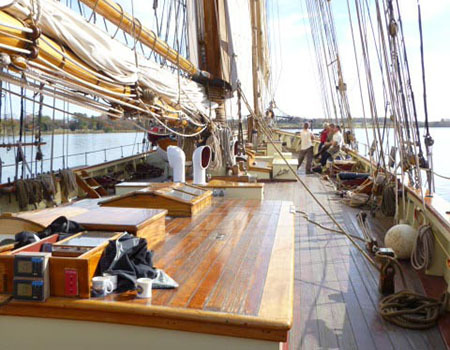 Do expect to really experience sailing a traditional tall ship, a Baltimore Clipper. It’s an immersive experience. 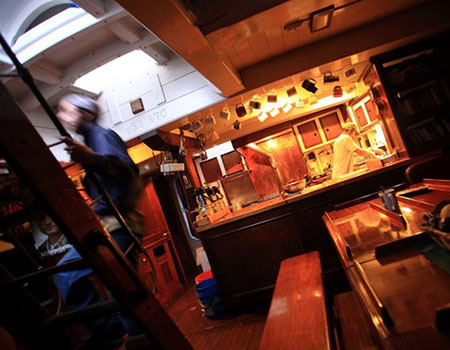 Guest crew work right alongside Pride‘s professional crew, stay in the same cabins, and eat with the whole crew. 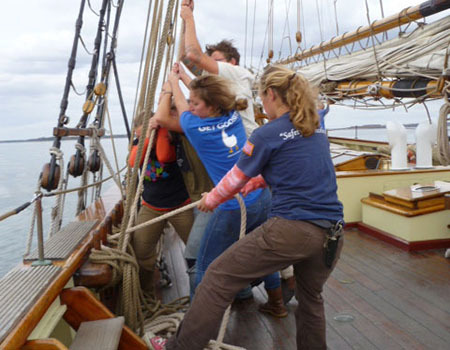 If you have never sailed on Pride II before, scroll down to find out a little about sailing on this famous topsail schooner. The deck on Pride II is open, so be sure to pack items to protect you from the elements — sun, rain, and wind. Plan for wet, dry, cold, and hot — there is no way to predict what the weather and conditions will be while you are sailing. Not to dampen your enthusiasm, but the ride might be rocking and rolling at times, so please anticipate and plan for being seasick (even seasoned sailors get seasick!). 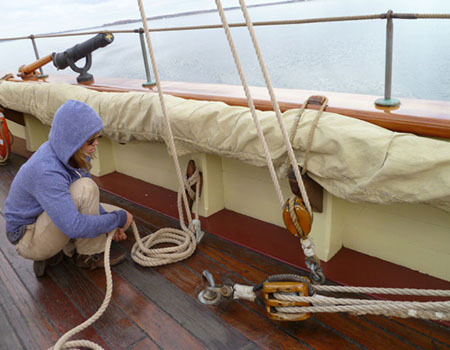 furling sails, taking the helm, helping with ship maintenance, and more. Just like the professional crew, you will be assigned to watches, but you’ll have time to yourself, so don’t forget to bring a book or other items to amuse yourself. 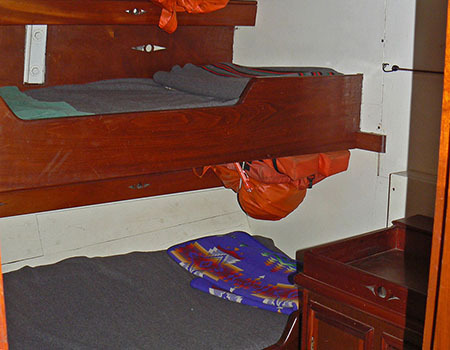 Guest crew cabins are doubles with two single bunks and all guest crew share one guest crew head. The main salon is where all crew eat. Meals are usually served buffet style from the galley. Pride has a great cook so you’ll eat well! Here is a drawing of Pride II below deck. Click on it to view a larger image. 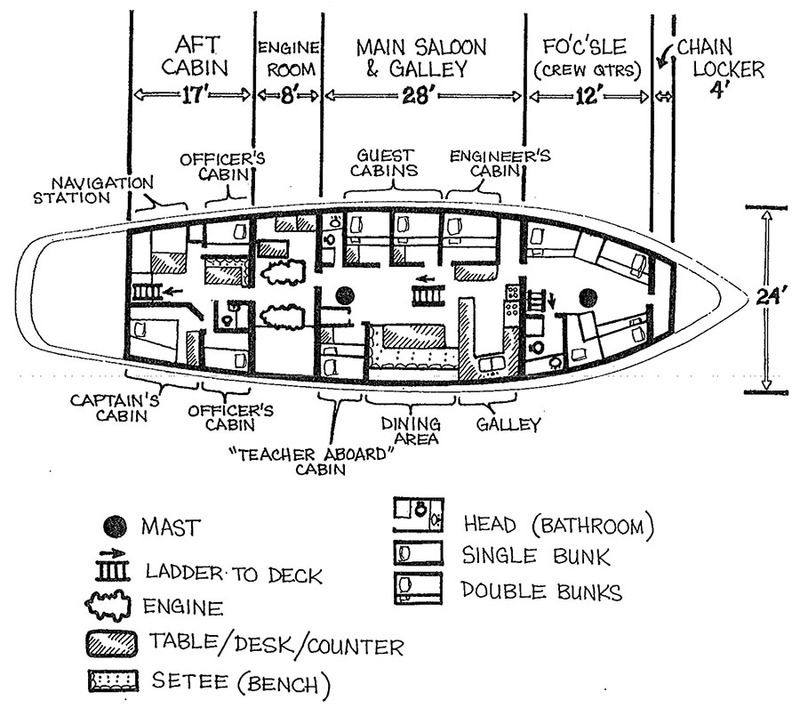 This will give you some idea as to the size of the cabins and other shared areas below. Hopefully, you now have a better idea of what to expect if you join Pride of Baltimore II as guest crew. If you have any questions, please contact us at pride2@pride2.org or 410.539.1151.